Tips to survive robot Armageddon. One of the primary abilities that Beck, Mighty No. 9’s protagonist, has is called AcXelerate. It’s basically a dash maneuver that will become your best friend during both combat and world traversal. AcXelerate will let you cross large spaces if you keep pressing the button (R1/RB), although you should keep in mind that you drop slightly between presses. 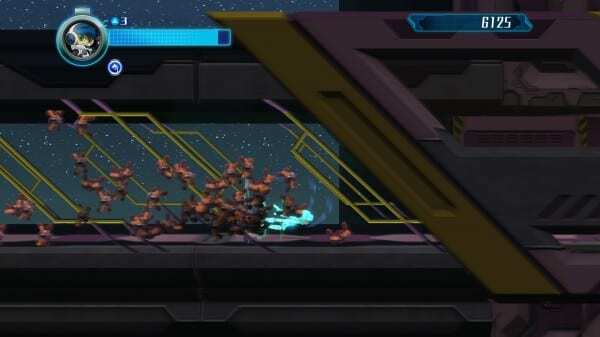 Still, it can get you to most hard-to-reach, far off spaces, and is crucial in dodging most, if not all, enemy attacks. Dashing is also how you absorb enemies. This can lead to power ups, but, most importantly, it can drastically increase your score. Another benefit is that the use of AcXelerate will slowly build up AcXel Recover, a healing item that will keep you in the game for a bit longer.